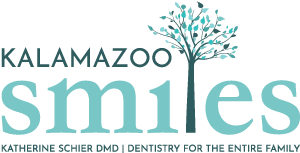 Have questions for our dentist in Kalamazoo, MI? Dr. Katherine Schier understands that patients often have questions between appointments. Check out our list of frequently asked questions below to learn how to maintain a healthy smile. To request an appointment with Dr. Schier, call Kalamazoo Smiles at (269) 353-3700. Enamel is the white outer layer of your teeth that protects the sensitive dentin within. When you lose enamel, your teeth become more sensitive to hot and cold things. For example, eating ice cream may trigger tooth sensitivity. Once you lose enamel, it’s gone forever. For this reason, it’s important that you brush your teeth twice a day and floss once daily. Plaque and tartar buildup can erode enamel, making teeth sensitive. Receding gums can also make teeth sensitive. If you have sensitive teeth, ask Dr. Schier if there are any products or procedures that can help. Brush your teeth twice a day for two minutes at a time. You’ll also need to floss once daily to remove plaque trapped between teeth and along the gums. Remember to schedule a teeth cleaning and oral examination with our dentist in Kalamazoo, MI at least every 6 months. That way, she can catch oral health issues while they’re small and at their most treatable. Gingivitis is the first stage of gum disease caused by plaque and tartar buildup. Plaque is an invisible film of bacteria that lives on your teeth and gums. This bacteria produces an acid that erodes tooth enamel and destroys gums over time. You may have gingivitis if you have red, swollen, or bleeding gums. If you suspect you have gingivitis, request an appointment with Dr. Schier as soon as possible. She’ll be able to recommend a good oral hygiene routine to help you reverse gingivitis. Periodontal disease is the advanced stage of gum disease. This condition happens when plaque and tartar surrounds teeth and enters the gums. You may have periodontal disease if you have bad breath or receding gums. Other symptoms include tooth loss, dental abscesses, and oral pain. Scaling and root planing can slow the progression of periodontal disease. Otherwise, periodontal disease is irreversible. During scaling and root planing, Dr. Schier cleans the deep gum pockets around your teeth. She then smooths out tooth roots so receding gums have a chance of reattaching to teeth. Dr. Schier offers cosmetic dentistry to help patients smile with confidence. The goal of cosmetic dentistry is to improve the appearance of visible teeth and gums. Our cosmetic services include teeth whitening, porcelain veneers, and cosmetic bonding. Request a consultation with Dr. Schier to learn more about your options. Over time, certain foods and drinks (like coffee) stain the outer layer of your teeth. Dr. Schier can help you achieve a whiter smile in one appointment with Zoom. Zoom teeth whitening is safe and effective under the supervision of our Kalamazoo, MI dentist. Cosmetic bonding repairs front teeth with small chips, cracks, and other irregularities. Dr. Schier can also use cosmetic bonding to fill small gaps between front teeth. During the procedure, Dr. Schier molds and bonds a special putty to the surface of your tooth. Teeth bonding takes one appointment, giving you immediate results. Veneers are wafer-thin porcelain shells we bond to the fronts of your teeth. Porcelain veneers cover chips, cracks, stains, and other minor imperfections. Dr. Schier may recommend a dental crown to restore a tooth made fragile by injury or decay. A dental crown fits over a tooth to restore its strength and appearance. The dental crown procedure takes two appointments, unless we use CEREC. A dental implant is a titanium rod that’s placed in your jaw to act like a tooth root. Later, Dr. Schier places a dental crown over top to give you the appearance of a natural tooth. Unlike dentures, dental implants are stable because they’re embedded in the jaw. This allows you to eat, talk, and smile with confidence after tooth loss. Your body is able to sense missing teeth and will absorb minerals from your jawbone to use elsewhere. Dental implants stop jawbone deterioration so you can avoid further tooth loss. Many patients also prefer dental implants because they look and feel natural. You must have enough bone density in your jaw to support dental implants. Dr. Schier may recommend a bone graft if you need higher jawbone density. You should also have good oral health and a strong immune system to qualify for a tooth implant. In general, dental implants can last up to 30 years or even a lifetime with proper care.